Cal will finally be back at the good ol’ Memorial Stadium this season. However, Cal also has the 9th toughest schedule according to Bruce Feldman of CBS Sports. This could mean that Cal could get crushed like a pulp, barely make it to a bowl game, or possibly have the most amazing season in Cal history (you never know). Even if you are a NegaBear and think that Cal will barely make it through the season, you have to be excited for some big time games for Cal. Here are three games that stand out the most for Cal. For Cal’s first away game, they will have to meet the Buckeyes at The Horseshoe, which is one of the loudest, craziest, and most intimidating crowds in all of college football. The Horseshoe holds an incredible 90,000 plus raucous fans and they sellout every single game. Even though Ohio State fans will drown out any Cal fans, Ohio State’s Athletic Department only gave Cal a measly 1200 tickets (I think someone is scared). If Cal can somehow outplay a ranked Ohio State team led by Coach Urban Meyer, this game will propel Cal through the rest of the season. This game will show how much our playmakers like Zach Maynard, Keenan Allen, and DeAndre Coleman have matured. A victory at Ohio State will show the strength of the Pac-12 and bring back the spotlight to Cal, setting up a potential Game Day matchup against USC (who will most likely be ranked #1). If you are a Cal fan, you always mark the calendar for the game against USC. This year USC will most likely be ranked #1 in the nation when Cal faces them. Unfortunately, Cal will have to face USC at the Coliseum in LA. If Cal had beaten USC the past few years, it would be a great triumph, but beating USC in 2012 would be one of the greatest triumphs EVER. Cal will have no rest traveling between Ohio State and USC, but there will definitely be a sense of urgency and respected hate against the Trojans on game day. For many Cal fans, this game against Washington is easily the biggest game of the season for Cal. I could have chosen Stanford or Oregon, but there is just too much hate against those wretched Huskies. Last season, the Huskies barely defeated the Bears and the season before that, they prevented Cal from receiving a bowl berth. However, the biggest reason for hate against Huskies, is the heartbreaking loss of former defensive line coach and ace recruiter Tosh Lupoi. Cal’s former wide receiver coach/offense coordinator Eric Kiesau also left for the Huskies, but at least he gave Tedford a heads up. 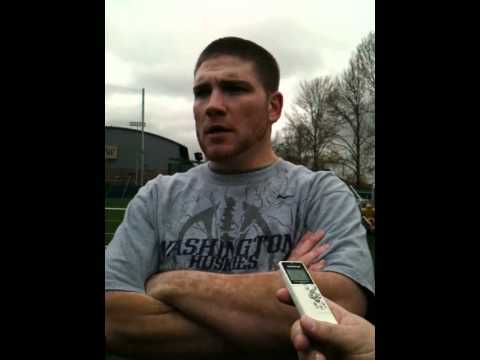 Had the Huskies not stolen Tosh from Cal, Cal would have had a top ten class for 2012. Tosh’s betrayal to his hometown and alma mater will never be forgiven. We knew that Tosh was given many offers in the past few years from other schools, but we thought that his heart and dedication to Cal outweighed any monetary benefits. How wrong we were. This game against Washington is a way for the Bears to stick it to the hated Huskies and Tosh Lupoi, and show them that their unethical ways have no place on the football field. BERKELEY – When Cal travels to Ohio Stadium in Columbus to take on Ohio State on Saturday, Sept. 15, 2012, the game will be telecast to a national audience on ABC. Kickoff for the first meeting between the Golden Bears and Buckeyes since 1972 is scheduled for Noon ET/9 a.m. PT. In addition to the ABC telecast, the commercial radio broadcast of the Cal-Ohio State contest and all 2012 Cal football games this season can be heard on the Cal IMG Radio Network, with KGO 810 AM in San Francisco serving as the flagship station. The KGO broadcast is also available live online at CalBears.com. A very limited number of tickets in the Cal seating section for the Cal-Ohio State game in Columbus will go on sale to ESP participants, season-ticket holders and donors on a first-come, first-served basis beginning Wednesday, June 20. All tickets purchased through Cal Athletics are $70 each, plus handling fees. Per Big Ten policy, everyone regardless of age, must have a ticket to enter Ohio Stadium. Each ticket-holder account will be limited to two tickets, with tickets available for purchase at 9 a.m. PT each day according to the schedule below, based upon availability. Cal has issued the same number of limited seats to Ohio State when the Buckeyes visit Memorial Stadium on Sept. 14, 2013. Cal-Ohio State tickets must be purchased by the account holder of record by logging into the appropriate account at CalBears.com, calling (800) GO BEARS (462-3277) Monday-Friday from 9 a.m. – 5:30 p.m. PT, or in person at the Cal Athletics Ticket Office (Monday – Friday, 9 a.m. – 4 p.m. PT). Fans will have the opportunity to purchase California Alumni Association (CAA) tailgate passes during the process. GET Travel, the official travel partner of Cal Athletics, has packages available for Cal fans. For details, visit gettravel.com/cal. Cal and Ohio State first met in the Rose Bowl on Jan. 1, 1921, when Cal’s Andy Smith-led team shutout Ohio State, 28-0. Ohio State returned the favor in the Rose Bowl on Jan. 2, 1950, with a 17-14 victory over the Bears. Overall, Ohio State owns a 5-1 series lead, but the teams have not met since then-third-ranked Ohio State won, 35-18, during the 1972 season in Berkeley. Season tickets for Cal’s return to a renovated Memorial Stadium in 2012 are currently on sale by calling (800) GO BEARS (800-462-3277), online at CalBears.com, or in person at the Sales and Service Center located in the Haas Pavilion Club Room Monday-Friday from 8:30 a.m. – 5:30 p.m. PT. More season-ticket information is available at CalBears.com. Cal opens the 2012 season at home against Nevada on Saturday, Sept. 1. Cal’s seven-game home slate will also feature Pac-12 contests against Arizona State, Oregon, Stanford, Washington and UCLA, as well as a non-conference tilt against Southern Utah. For updates on the progress of the renovation and retrofit of Memorial Stadium, as well as the Memorial Stadium webcam, visit stadium.berkeley.edu. In addition to the game in Columbus, Cal plays on the road in 2012 at Oregon State, USC, Utah and Washington State. Starting times, television and single-game ticket information for the remainder of the 2012 Cal football schedule will be announced at a later date.